India’s clean energy investments have risen faster than any other country, growing 52 percent to a total $10.3 billion in 2011. Leading the rise in India’s clean energy sector was the solar industry, with $4.2 billion in funding for grid-connected solar power plants, a sevenfold increase from 2010 levels. Investments in wind energy remained about the same, with about $4.6 billion going into wind projects. The recent numbers come from Bloomberg New Energy Finance, and reveal that investing in clean energy is a very real possibility for developing countries. In fact, India’s addition of 2,827 megawatts of new wind capacity in 2011 made it the third biggest market for wind power in the world after China and the United States. 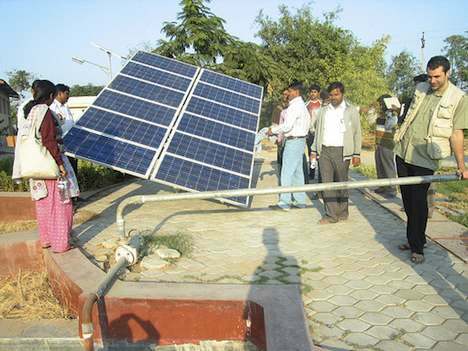 Meanwhile, India advanced its solar capacity from 18 megawatts in 2010 to 277 megawatts in 2011. BNEF suggests that a 1,000 megawatt total for solar capacity in India in 2012 is not too far off. A closer look at the solar industry in India reveals that the recent surge in solar panel installation has been spurred by declining solar panel costs over the past few years. In fact, 2011 saw the price for solar panels drop by 50 percent, thus making them cost 1/4 of what they cost back in 2008. The huge price decreases have in fact made it cheaper to produce power from solar cells than diesel generators in India. Currently, 25 percent of people in India are not connected to the power. But even the population that is connected to the grid suffers from frequent blackouts. As a result many households and businesses turn to diesel for power. But now that solar costs only 8.78 rupees per kilowatt-hour (compared to 17 rupees for diesel) it increasingly makes more sense for households to invest in solar panels. Currently the only barrier to increased solar panel uptake is its higher initial cost. But as the price for solar panels continues to decline, we could see more and more populations in the developing world turning to clean energy for their electricity needs. Some analysts even suggest we could be seeing the emergence of a ‘solar revolution’ in the developing world.